With the release of the 2018 MacBook Pro laptops, Blackmagic Design released an external Graphics Processing Unit (eGPU) to provide more graphics horsepower to the laptop. 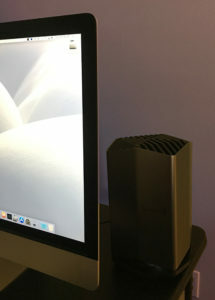 Co-developed by Blackmagic Design and Apple, this external unit gives laptop owners access to an AMD Radeon 580 GPU, without creating extra heat or battery drain in the computer itself. Recently, Blackmagic loaned me a unit for a couple of weeks to test for this review. The eGPU is extremely easy to set up, requiring only two cords and no configuration. It’s core benefits include: a beefy GPU, the ability to charge any laptop connected to it, and a dock providing multiple USB 3.1, Thunderbolt 3 and HDMI ports. The eGPU is luggable, but designed to sit on a desk and act as a docking station. The downside is that, right now, not a whole lot of software supports this device. (More on that later in this review.) Also, it requires Thunderbolt 3 and macOS High Sierra or later running on your computer. Unbox the unit. Put it next to your computer – the Thunderbolt cable is only a foot long, so the eGPU will need to be close. Connect power, connect Thunderbolt. Done. There’s no power switch. It turns on or off when the computer does. There is no software to configure. It is amazingly easy! There’s a small icon in the menu bar at the top of the computer that indicates the eGPU is connected. You use this to disconnect the unit from the computer. NOTE: You must not simply pull the cable to disconnect the unit. You need to disconnect it like a hard disk. There is a small glowing white light at the base of the unit when it is on. The ports on the back don’t glow. Essentially, you connect it and forget it. In fact, you can connect an external keyboard, mouse, even an iPhone to the eGPU. Then, connect everything to the laptop using the single Thunderbolt cable. The problem is that this unit is ahead of its time. Most non-Blackmagic software doesn’t yet support eGPUs; the technology is too new. If you are running DaVinci Resolve 15, this unit will make it fly. 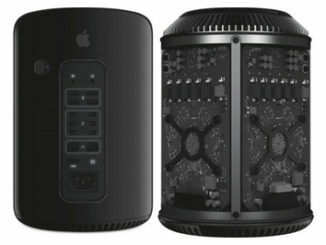 However, Adobe Premiere does not support eGPUs, yet, and in Apple Final Cut Pro X the current Thunderbolt 3 eGPU support benefits configurations that include video output. This means improved performance when connecting a 360 VR headset or second monitor directly to the external GPU. For example, with an HTC VIVE 360 headset, the external graphics card drives the headset, which allows the Mac to focus on playback, rendering, and other processes in Final Cut Pro. I haven’t done specific performance tests with this unit, because while I have a Thunderbolt 3 iMac, I don’t yet have a Thunderbolt 3 laptop. But, in looking further, I discovered something interesting. 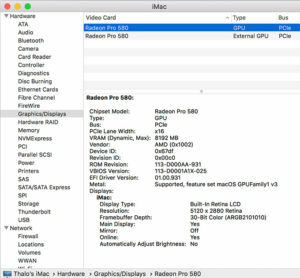 This is the System Report for the built-in Radeon 580 in the 27″ iMac. This is the System Report for the Radeon 580 in the eGPU. Notice that the built-in GPU uses 16 PCIe lanes, while the eGPU only uses 4. This, I suspect, is due to the speed limitations of Thunderbolt 3. The GPU is the same, but the connection speed to the eGPU is slower. 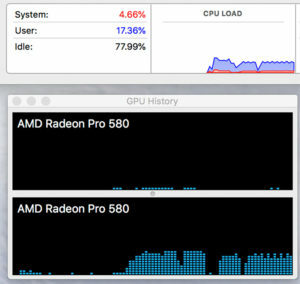 You can monitor the GPU activity by opening Activity Monitor (Utilities > Activity Monitor) and choosing View > GPU History. The chart shows all connected GPUs and how busy they are. NOTE: In this screen shot, I’m running five different particle systems in Motion 5, which does not yet support the eGPU. The eGPU (top) is just hanging out, while the internal GPU is busy pushing pixels. You can also see compare GPU activity to the CPU; the CPU is barely working. As I was preparing this review, I spoke with Bob Caniglia, Director of Sales Operations, North America, for Blackmagic Design, to learn more. 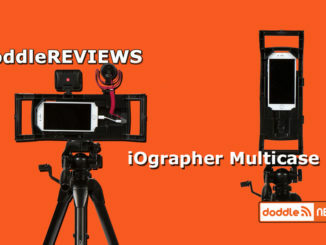 Bob told me that their ongoing partnership with Apple lead to this opportunity, which provided the Blackmagic team with a chance to do some new industrial design, as well as improve the user experience for DaVinci Resolve users. 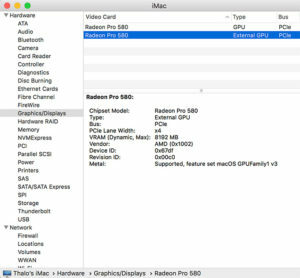 BMD picked the Radeon 580 because they wanted to match the performance of the iMac GPU in the MacBook Pro laptop. Bob also told me that the biggest performance gains come when using the eGPU with a 13″ MacBook Pro. This makes the 13″ laptop more attractive because of it’s lower purchase price. Larry: Why did BMD create this? 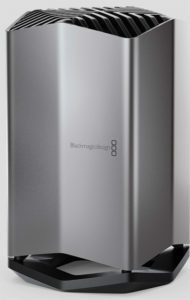 Bob: Designed to address the needs of professional video editors, Hollywood colorists and visual effects artists who need to remain mobile, but want the power of a desktop class GPU added to their MacBook Pro, the Blackmagic eGPU is incredibly flexible and simply plugs in via Thunderbolt 3, so users can benefit from improved graphics performance and acceleration of computational tasks. Our DaVinci Resolve customers often need to add a lot of effects and color correctors to their timeline and this can consume a massive amount of computing power. In many ways, DaVinci Resolve customers can even keep adding color correctors up to the point where they max out the computing power of the host machine. However, many DaVinci Resolve editors and colorists also like to remain portable which allows them to work on-set. By developing the Blackmagic eGPU, we can provide the processing power they need and allow more effects and color corrections, even when working on a laptop. So, it’s perfect for speeding up professional creative application workflows including editing, color correction and visual effects with DaVinci Resolve. Also, the Blackmagic eGPU adds the performance customers need to make the latest 3D games and VR look more realistic than ever. That means customers will get higher resolution images, higher frame rate gameplay, better lighting and more detailed textures for truly immersive experiences, even on a laptop computer. Larry: Who is it designed for (i.e, who would benefit from buying this)? 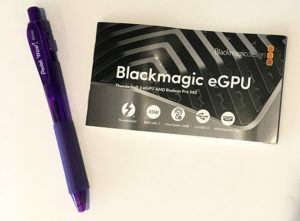 Bob: The Blackmagic eGPU is a high performance graphics processor for pro creative software such as DaVinci Resolve, as well as 3D games and VR. 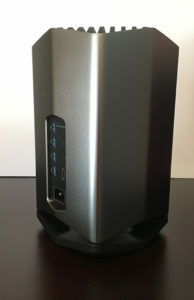 The Blackmagic eGPU is incredibly flexible and can be used to improve both graphics performance and to accelerate computational tasks. It’s perfect for accelerating pro app creative workflows such as editing, color correction and visual effects with DaVinci Resolve. So, on that front, any creatives who need the power of a desktop class GPU. When it comes to image processing, the Blackmagic eGPU adds the performance to make games and VR look more realistic than ever. You get higher resolution images, higher frame rate gameplay, better lighting and more detailed textures for truly immersive experiences. Larry: What types of calculations does an eGPU enhance? Bob: The eGPU is used to improve both graphics performance and to accelerate computational tasks. It’s perfect for accelerating pro app creative workflows such as editing, color correction and visual effects with DaVinci Resolve. When it comes to image processing, the Blackmagic eGPU adds the performance to make games and VR look more realistic than ever. You get higher resolution images, higher frame rate gameplay, better lighting and more detailed textures. Larry: How should I test it to show how it improves performance? Bob: Test it with performance intensive applications, such as spatial noise reduction, film grain or temporal noise reduction, or by adding a lot of effects and color correctors to the timeline. Customers running DaVinci Resolve 15 can expect increased performance for editing with more real time effects, color corrections with more nodes and spectacular ResolveFX such as film grain, light rays, blurs and more. Larry: What apps take advantage of the additional processing power? Bob: Blackmagic eGPU support in macOS High Sierra 10.13.6 is designed to accelerate Metal, OpenGL, and OpenCL applications. However, not all applications support eGPU acceleration and it is best to check with the application’s developer to learn more. DaVinci Resolve 15 will see and take advantage of the Blackmagic eGPU which means that processing of filters, effects and color corrections will be much faster. Customers can also select various GPU options from the DaVinci Resolve preferences where it’s also possible to select which and how many GPUs to use for image processing. DaVinci Resolve can also take advantage of multiple Blackmagic eGPU’s for image processing even when an external monitor is not connected. The Blackmagic eGPU also supports Metal from Apple, so performance will be faster when using any application that supports Metal. Larry: Why is it not upgradeable? Bob: The design has been optimized for quiet operation so it’s better suited for creative customers. This means the design is not a simple chassis with a PCIe card plugged in, but an integrated electronics, mechanical and cooling design that cannot have the GPU chip upgraded or changed. Larry: What role did Apple play in the design process? 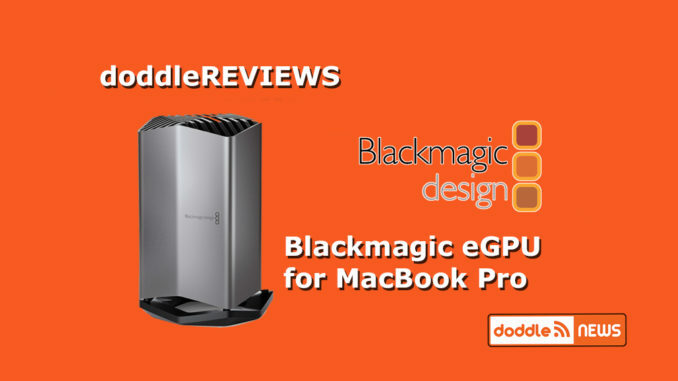 Bob: The Blackmagic eGPU was developed by Blackmagic Design in collaboration with Apple and around Apple-centric features and products, such as Metal and the Radeon Pro 580 GPU, which is the GPU found in the high end 2017 model of 27 inch iMac. Larry: What are the system requirements? Bob: The Blackmagic eGPU will work with all Thunderbolt 3 based Apple computers that are running macOS 10.13.6 or later. This includes MacBook Pro computers from the 2016 model year and later, 2017 iMac and iMac Pro. Larry: How can we tell if it is in use / speeding things up (i.e. is there something like Activity Monitor that shows how hard it is working)? Bob: There is a [white] LED underneath the Blackmagic eGPU that will indicate when power is applied and the Blackmagic eGPU is operating and the eGPU symbol appears at the top menu bar of the computer desktop when an eGPU is connected. To check whether an application is using the Blackmagic eGPU, simply open the Activity Monitor > GPU History to see which GPU is working. If a computer display is connected to the HDMI or Thunderbolt 3 outputs on the Blackmagic eGPU, then you should also see the extra desktop space in the display’s system preference. You can confirm your computer is being accelerated by the Blackmagic eGPU using the following steps. First start the application software that you want to check, then open the activity monitor application in your application’s folder, finally in the menu bar, click window and select GPU history. You should see a histogram of the GPU usage level of the Blackmagic eGPU and you can see if it’s accelerating your application software. Larry: Why the Radeon 580 and not some other GPU? Bob: There were several factors, including price, performance and the relationship with Apple. Since it was designed in collaboration with Apple, we built it around the GPU specifically found in the high end 2017 model of 27 inch iMac, the Radeon Pro 580 GPU. Additionally, the Radeon Pro 580 delivers stunning graphics and incredible computational performance. The Radeon Pro 580 can fill a massive 38.4 billion textured pixels per second, plus, you get support for Metal graphics technology from Apple, which provides near-direct access to the GPU for maximizing graphics and compute performance with games and applications. It is clear that Apple wants to provide additional power or functionality to our computers by making it easy to connect external devices. And installing the Blackmagic eGPU could not be easier. But, this is a specialized product for a specialized audience. If you want maximum GPU power, get a desktop system. The eGPU works best for users that need portability first, power second. I like that it provides lots of port options; the docking capability of the eGPU is a significant added value, as is the ability to charge both laptops and phones. The key gating factor, though, is software support. We are in a “chicken-and-egg” situation right now. Until the hardware exists, software won’t be developed for it. Now, the hardware exists, but we need to wait until developers catch up to the capability of the hardware. Mojave will bring additional capability to eGPUs when that ships in the fall. As well, IBC in September will bring a host of software upgrades from a variety of vendors. I fully expect eGPU support to be a highlight of the show. Blackmagic has started the parade. Now, we need to wait a bit until the rest of the world catches up.